On a blustery January evening, fifteen people trickle into the cafeteria of New Sullivan Elementary School in South Chicago, gathering around the gray folding tables while exchanging warm greetings and inquiries about each other’s families. But while it may seem like a casual meeting, these residents of Chicago’s 10th Ward are here to get things done. At stake is how the ward will spend this year’s “menu money,” the $1.3 million that each ward in Chicago receives annually for all of its routine and discretionary infrastructure works. This particular meeting is an example of participatory budgeting (PB), a growing movement to allow community members to directly decide how to allocate parts of their community’s budget. The process is meant to foster ties within the community, as well as between residents and their government. Participatory budgeting in Chicago began in 2009 in the 49th Ward, and is operating in seven wards during the 2015-2016 cycle, including the 10th. “What’s cool about PB,” first-term Alderwoman Susan Garza says, “is that before, we never knew how the money was spent.” This year, residents of the 10th Ward will work with her office to create project proposals. The year-long process will culminate in April with an exhibition and a vote on how to spend the money. The five phases of the process are explained to the community members by Nicole Garcia, a staffer for the alderman’s office. First is the informational phase, in which meetings held in each area of the ward explain what PB is. The second phase, idea collection, is what’s happening tonight: community members gather to brainstorm ideas for how to spend the menu money, and these ideas are collected by the alderman’s office. Once several brainstorming meetings have been held in different parts of the ward, the residents who came up with the ideas begin shaping them into project proposals. This phase involves finding data on previous problems and on the existing infrastructure, as well as taking into consideration upcoming projects by other departments of the city that may affect the proposed project. The residents and Garza’s office must therefore work together to create project proposals with cost estimates. This work culminates in the fourth phase, the project expo, which will present each project proposal at different locations around the ward for community members to assess. Finally, in the fifth phase, community members are able to vote on which project proposals will be constructed. The project proposals that make it to the ballot are determined by the leadership committee, which is made up of people who want to be more involved in the process. The ballot phase of PB is special in that unlike for governmental elections, residents do not need to be registered voters to participate. “Everyone who lives here, even if they’re undocumented or sixteen years old, has a way to participate that they haven’t before,” says Amalia NietoGomez, a resident at the meeting. Following Garcia’s explanation of the PB process, the staffers break the meeting up into groups of five to brainstorm ideas. The markers and huge sheets of paper that are brought out add to the sense of excited creativity as people bring out ideas that they have long wanted to see implemented. Many of the proposals are very specific, and residents bounce ideas off each other as they recognize the locations in question. A skate park is proposed for the intersection of Mackinaw and 91st Street, since many kids don’t have a safe place to play. Another resident suggests turning an old, now wooded railroad yard behind 8519 S. Brandon into a zip line rope park. Besides the creation of parks, the group’s other focus is finding ways to bring people into the neighborhood. Proposals include gateway art by Lakeshore Drive or Commercial Avenue, along with signs marking historic local landmarks like St. Michael the Archangel Catholic Church and the Chatham-Greater Grand Crossing Commercial District. The groups then reconvene to share their ideas with everyone at the meeting. Many of the proposals include parks and safe spaces, like changing a one-way road into a cul-de-sac to protect children who play there from cars. A mother suggests the creation of a baseball field using a series of vacant lots. The suggestions for gateway art and signage are popular, and a suggestion to place benches by the library gets enthusiastic nods all around. Many of the suggestions, though, end up falling outside the reach of PB. Since PB in Chicago is currently used only for menu money, projects must be within the ward’s jurisdiction and fall under the designated infrastructure uses of menu money. The creation of parks is a popular proposal in many wards because it can be done via PB and provides the community with new and improved green spaces. The purchase of lots, however, needs to be done through the city, and placing benches by bus stations is the CTA’s responsibility. Additionally, all funds for traditional infrastructure repairs, like repaving roads and updating lights, must also come out of the same $1.3 million of menu money. Most of the menu money is usually allocated for these categories of maintenance. The limited purpose of these funds led resident Karen Roothaan to point out that “it feels like we’re doing something the city would be doing.” Alderwoman Garza explained, however, that upon first taking office last year, there was only a short time frame to allocate the menu money before the city re-absorbed any that was unused. This raised the problem of relying on the staff members to spot problems, and asking residents to report things that need to be fixed. But some areas call in more than others, and the result was an uneven distribution of resources. Alderwoman Garza emphasized that “it’s up to us to say 87th and Mackinaw needs to get repaired,” or else it won’t be on the list of things to fix. 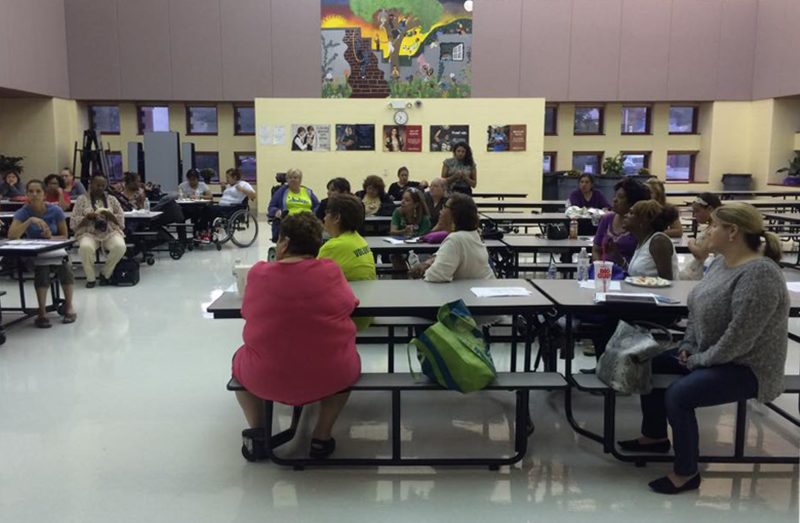 The 10th Ward is taking part in a process that is gaining attention throughout the country. The Participatory Budgeting Project (PBP) has also set up PB in New York City; Vallejo, California; San Francisco; St. Louis; and Boston. At a recent meeting of the city-wide steering committee of PBP staff, ward representatives and associated organizations, Maria Hadden, the PBP Project Manager for Chicago, said that the current goal of PB Chicago is to reach critical mass to obtain city resources, which could help with outreach and expansion. All of the wards present described the difficulty in getting the manpower to do sufficient outreach, especially with more personal interactions like phone calls. Osvaldo Caraballo Jr., a staff member from the 17th Ward, said, “Nothing is going to work unless people get involved.” At many of the meetings, residents wanted to know why no one had told them about PB earlier, indicating that better outreach resources would likely be helpful in increasing turnout and representation. Beyond the resources needed for outreach, the development of project proposals also requires a lot of research by both the residents and the aldermanic staff, sometimes resulting in fatigue on both sides. Insufficient technical support can result in project proposals that are difficult to implement, creating more problems down the line. Correction, February 11, 2016: The given name of the Chief of Staff for Alderwoman Susan Garza was misstated in one reference; he is Ismael Cuevas, not Ishmael. This article has an excellent summary of how PB works, and I love hearing about the ideas people have on how to spend it. More wards and alders should be leading their residents and collaborating how to spend $1.3 million.